Because the different levels in the ionosphere are electrically conducting, they interact with electromagnetic radio waves bending them in much the same manner that glass or water bends light. The refractive index of a layer in the ionosphere depends on its electron density and has an effect on waves according to their wavelength. Levels with higher electron densities (higher altitudes where recombination is slower) have lower refractive indices. As a wave passes up from below into such layers they get refracted, or bent back down towards the lower electron density layers. 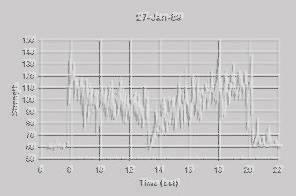 The amount of bending depends on the incident angle and the frequency of the wave. Higher frequencies are less affected. Finally, in passing through conducting layers, energy in the wave vibrates the electrons thus transfering some energy into the layer and being partially absorbed in the process. It should be noted that this expression is for the critical situation only. Where the angle is approximately known based on the circuit geometry and the frequency is known precisely, the density calculated will be the lowest density that, below which, no return (reception) will be possible. A radio wave of a given frequency therefor will continue to travel upwards into an ionsphere layer until it reaches the elevation where the density rises to the "critical" level (Nec) and the wave will be turned back to earth. 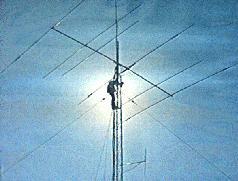 For most HF radio communication the main reflecting layer is the F layer situated between 200 to 300 KM altitude. The D and E layers are generally too weakly ionized to be of much importance except during the day over shorter distances. Ionization, although falling, persists through much of the night in the F layer as well. Intense ionization of the F layer causes it to warm and split into a second, higher, level during the day, returning to a single layer at night. There are also seasonal variations on the theme. The E layer, about 100-150 KM up, can persist into the night to some extant and in addition there are occasional "clouds" or masses of E level ionization which can drift causing sporadic radio openings when the right geometries exist. The D layer at about 80 to 90 KM is only useful for propogation during the day recombining quickly after sunset. In the negative sense, it absorbs signals passing through it to or from the F layer.